Click on the desired set of books below to see more information and sample pages for that set. Scroll down to see an overview of the books used to teach phonics patterns, general comments, and suggested teaching levels. ​After students have learned the letters of the alphabet and learned to read and spell short vowel words, they must learn the many additional phonics patterns (phonograms) used to represent sounds in words. This includes consonant patterns, such as sh/ship, th/thumb, and ch/chicken, and vowel patterns, such as ay/play, ow/cow, and ar/car. 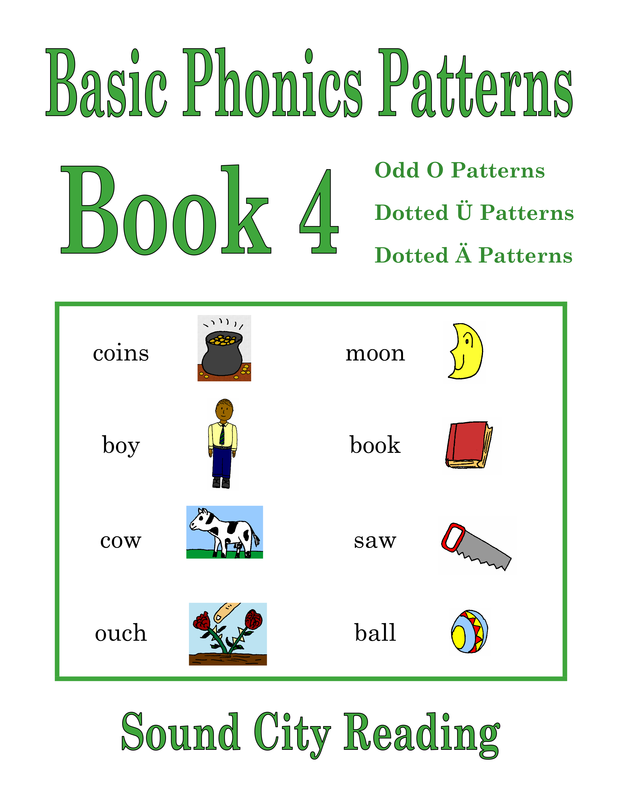 In this program, there are four types of books to teach the phonetic patterns. Each set teaches the same patterns in the same order but has a different format. Some have larger print and others have smaller print. Some are color-coded, with each vowel sound printed in a specific color, and some have all black print. In some books the phonetic words are illustrated, while in others they are not. This gives the teacher multiple choices when providing instruction. Short, illustrated practice stories are included in some but not all of the books. The four types of books are listed here. 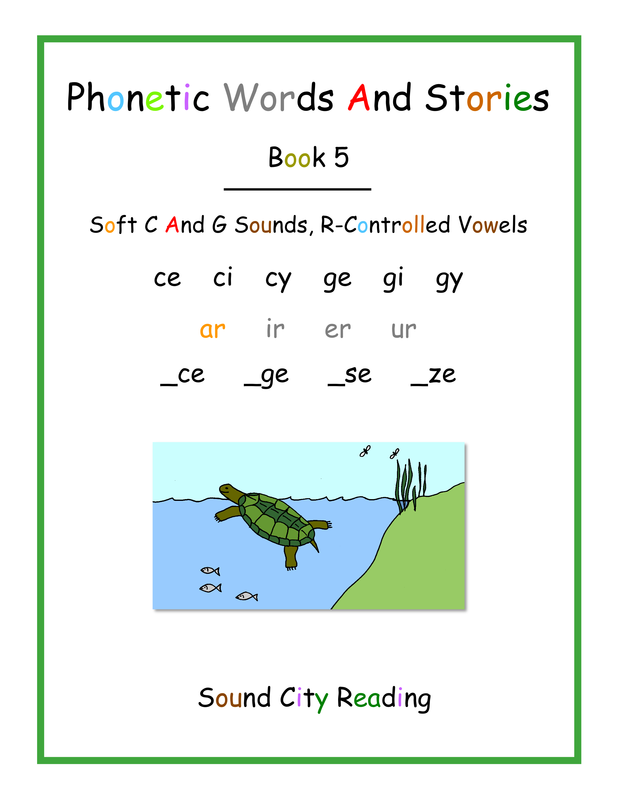 See more information and sample pages for each type of book using the sub-menu under Phonics Patterns. Smaller all black print, words are not illustrated, with single and multi-syllable word lists. These books contain the same short practice stories found in the books listed above. A third set of books is printed in even smaller, all black print. Short vowel words are included. 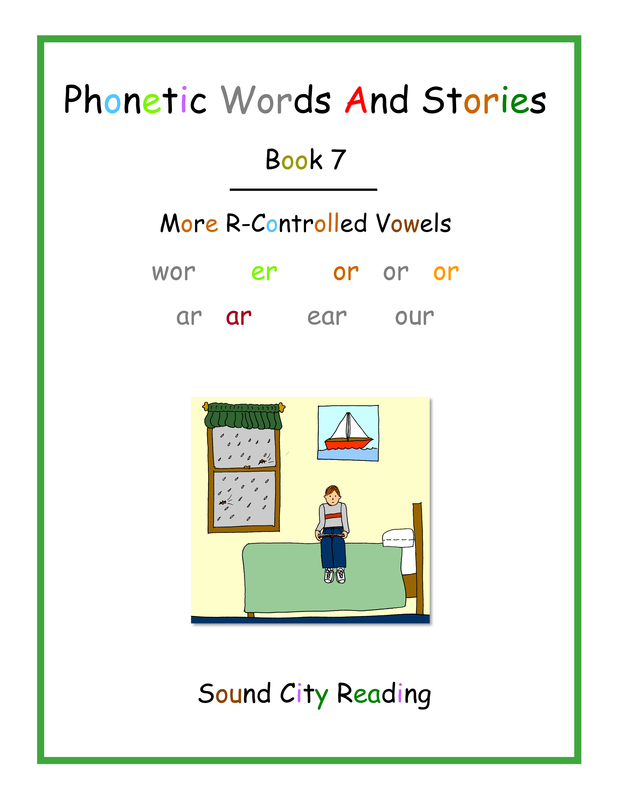 The phonetic word lists are more challenging because they include both one and two-syllable words as soon as the phonogram patterns are introduced. The words are not illustrated. The same practice stories found in the previously described books are included. Because there are no stories, all of the phonetic word lists for this level fit into a single book. 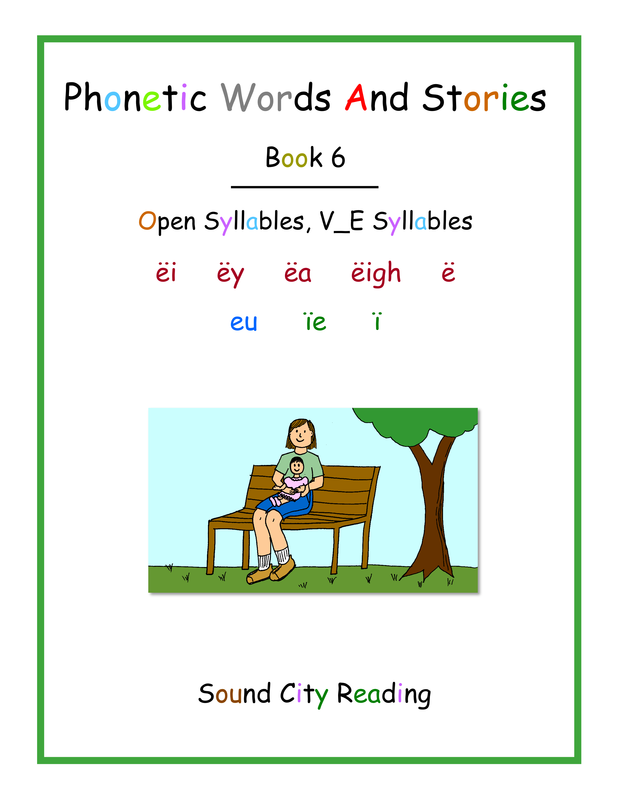 ​This book contains all of the phonics patterns taught in Phonetic Words And Stories, Books 1-3. It does not have practice stories. Students who are already reading can work through this book to study the phonics patterns while they are reading books at their current reading level. You can also use this as a companion book to Advanced Phonics Patterns From Children's Books, to provide ongoing review. Color-Coded Phonetic Lists Color-coded rhyming and body-coda word lists for all of the phonogram patterns taught. 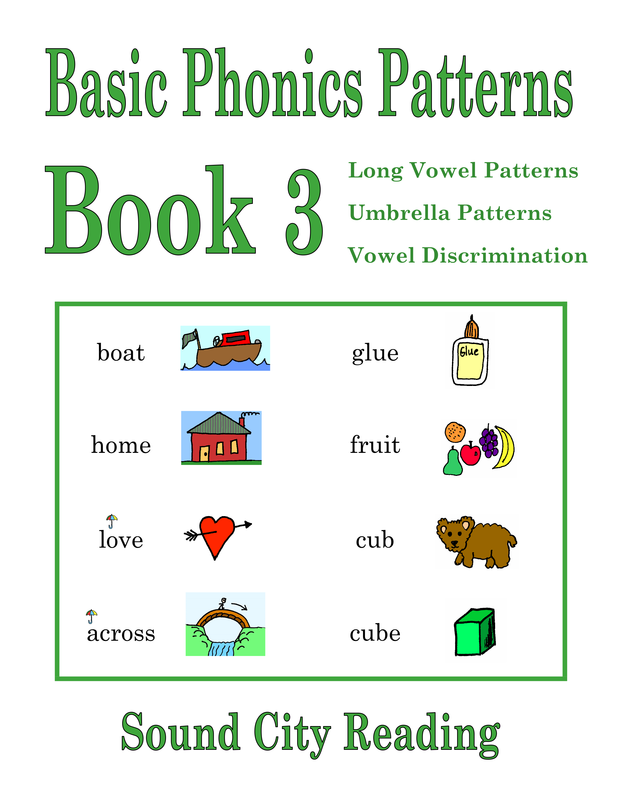 ​​ Finally, students can review the patterns and strengthen their decoding skills by reading Color-Coded Phonetic Lists. This book is not illustrated and does not have practice stories. It has both rhyming and body-coda word lists. In each word the vowel or vowel pattern is printed in a bright color. The color indicates the correct vowel sound. This helps students notice the vowel patterns in words. This is helpful because often the vowel sound in a word is made up of a "vowel team," such as ai/rain, ight/night, ow/cow, or ar/car. Students can clearly see which letters work together to represent the vowel sound. Students also notice that sometimes several different vowel patterns represent the same sound, as in ai/rain, ay/play, and a_e/safe. Finally, students notice that some vowel patterns can represent more than one sound, as in ou/ouch, ou/four, and ou/soup. In these words, the ou pattern is printed in three different colors, to indicate three different sounds. In all of the sets listed above, the phonics patterns are taught in a logical, sequential order. The most common, most needed, and easiest patterns are taught first. The less common patterns are taught later. Patterns that are similar are grouped together, providing a logical framework to help students learn them and apply them as they read. Students not only learn to read words with each new phonetic pattern, they also learn to spell them. To spell a word, students say each sound, in order, as they simultaneously write the related letters and letter patterns. As they say the individual sounds, students are segmenting the word. This is a fundamental phonemic awareness skill that opens the door to reading and writing. A few sight words are taught as exceptions to the rules after a new phonetic pattern has been taught. For example, after learning to read words with the ee pattern (see, feet, keep) students learn the sight word been. After learning the ai pattern (rain, paid, sail) students learn the sight word said. 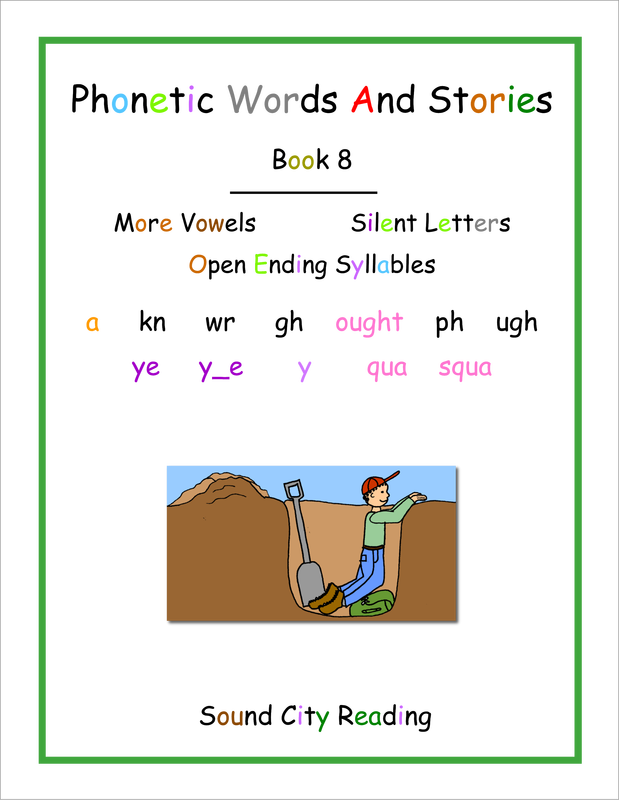 After students have studied several new phonetic patterns and related sight words, they will be able to read a short practice story containing words with those patterns. This way they can apply their new skills right away. 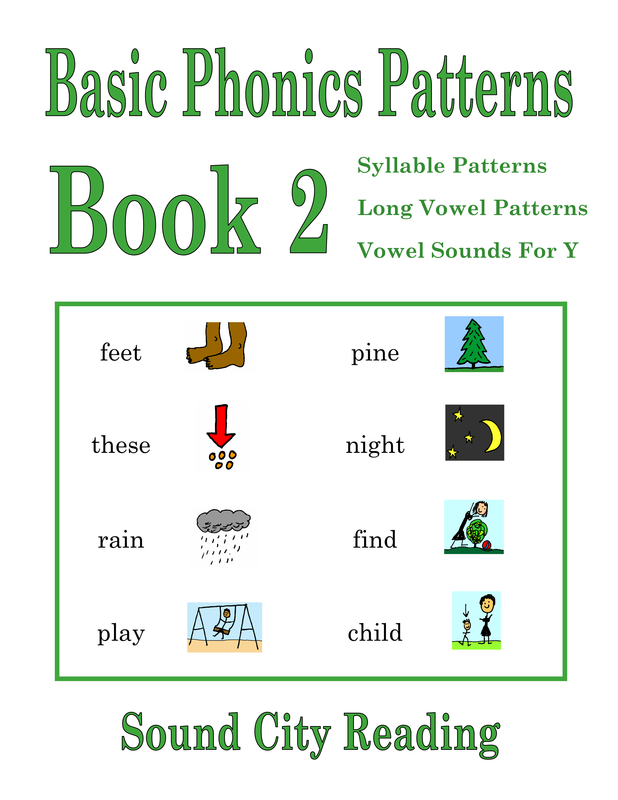 The first part of each book contains sound charts which show all of the phonetic patterns taught so far, with the addition of the newest patterns. On the charts, each phonogram is paired with a sound picture from A Sound Story About Audrey And Brad. For example, a picture of a growling dog shows the /r/ sound, a squeaking mouse shows the long /ee/ sound, and a crow shows the /aw/ sound. Students say the sounds from the charts as the teacher points to each pattern. The sound charts are expanded to include new patterns as students progress through the books. The last books contain more charts than the first books. Enlarged wall charts, showing the same letter patterns and sound pictures, are available to use in a classroom. The daily routine begins with a review of selected sound charts. Students say the sounds as the teacher point to the patterns on the charts. Sound pictures on the charts remind students of the correct sound if they forget. Next, the teacher uses a set of phonogram flashcards to review the same patterns. This time students must recognize the patterns and say the sounds without picture cues. This prepares students to recognize the patterns when reading words. The teacher also dictates selected patterns for students to write. This prepares students to spell words with those patterns. It is recommended that students also spell a few words with each new pattern. 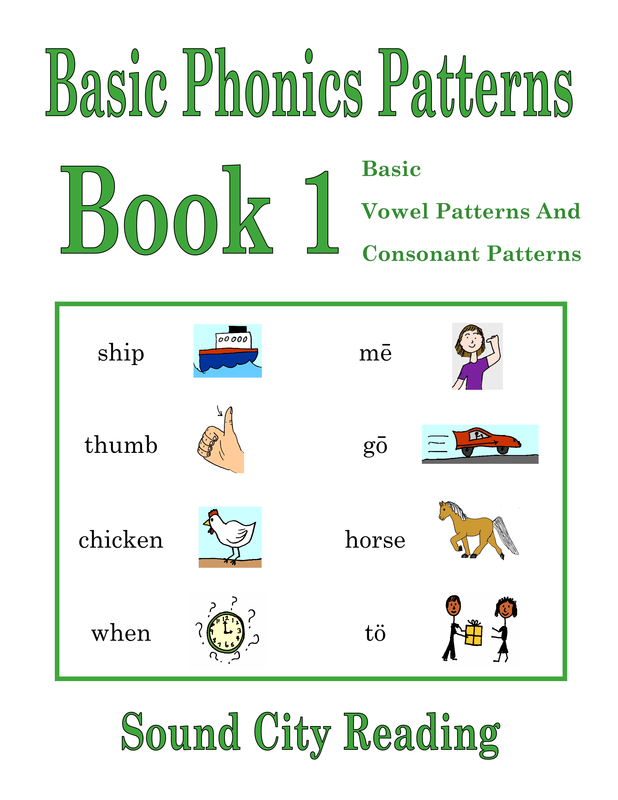 There are many patterns to learn, and daily review using the charts and phonogram cards provides the reinforcement needed for students to internalize the patterns so that they can apply them when reading and writing. Students can also play a learning game, the Caterpillar Game, in small groups to help them remember the patterns and their sounds. The patterns should be taught quickly, in general one new pattern per day for first graders, so that beginning students will be able to read real books as soon as possible. Older students may be able to cover two or three patterns per day. 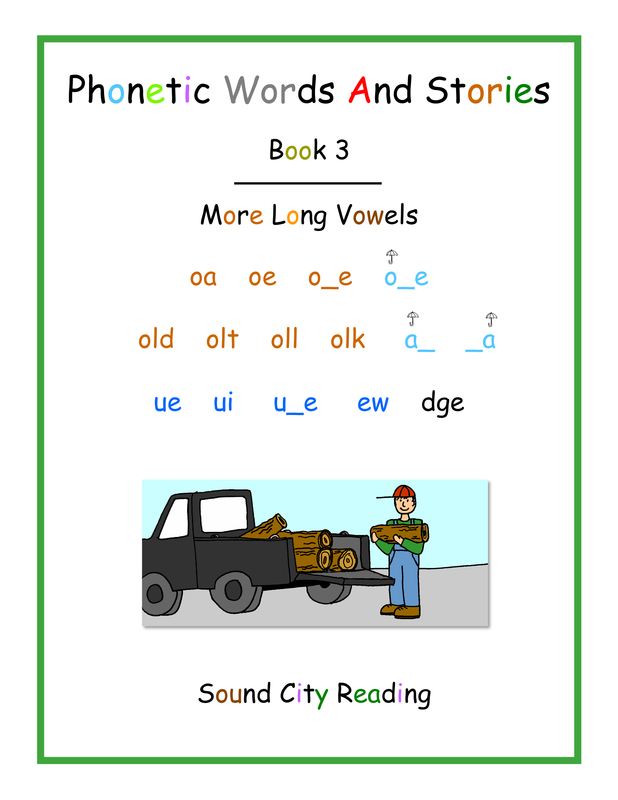 Kindergarten students who have mastered short vowel words may be able to complete the first books in the Phonetic Words And Stories series before the end of kindergarten. As they work through the program, students will also receive instruction on multi-syllable words, contractions, and words with suffixes. More information is provided in the instructions for the teacher found in each set of books. ​The books are purposefully not assigned to a specific grade level. 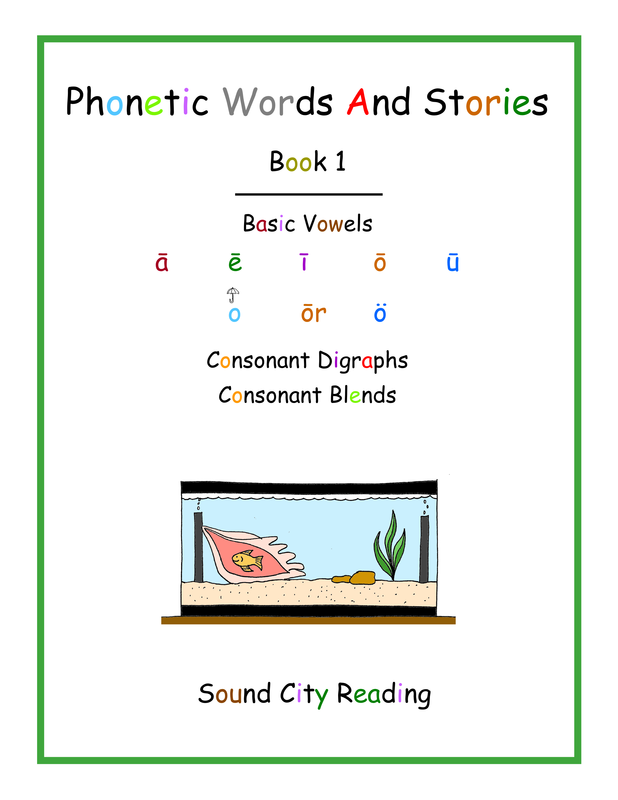 Some older students might need the larger, color-coded print and emphasis on phonemic awareness in the Phonetic Words And Stories Books, while some younger, less advanced students might do just fine in one of the other sets of books. However, here are some ideas about how the books might be used Students must know the letters of the alphabet and their sounds, be able to write the letters, and complete one of the short vowel books before beginning the phonics patterns books. 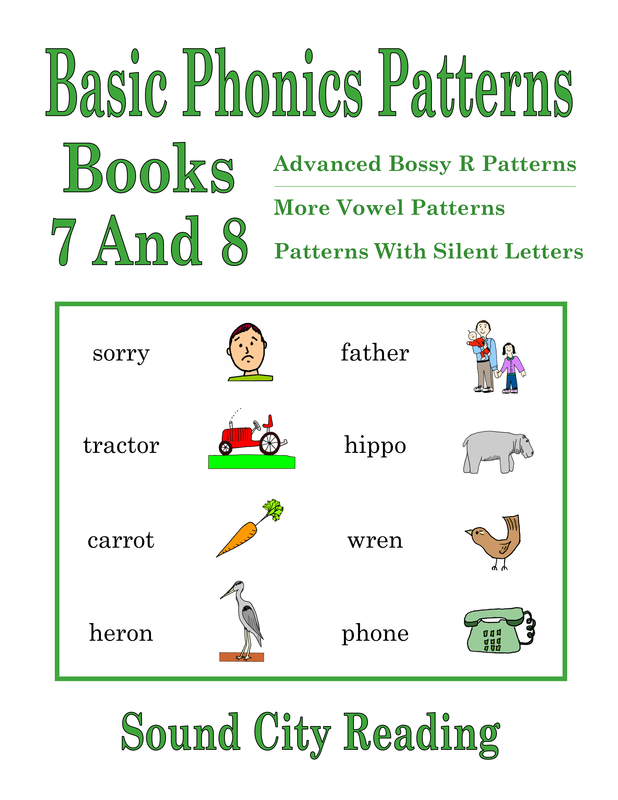 Advanced Phonics Patterns From Children's Books, if time permits. 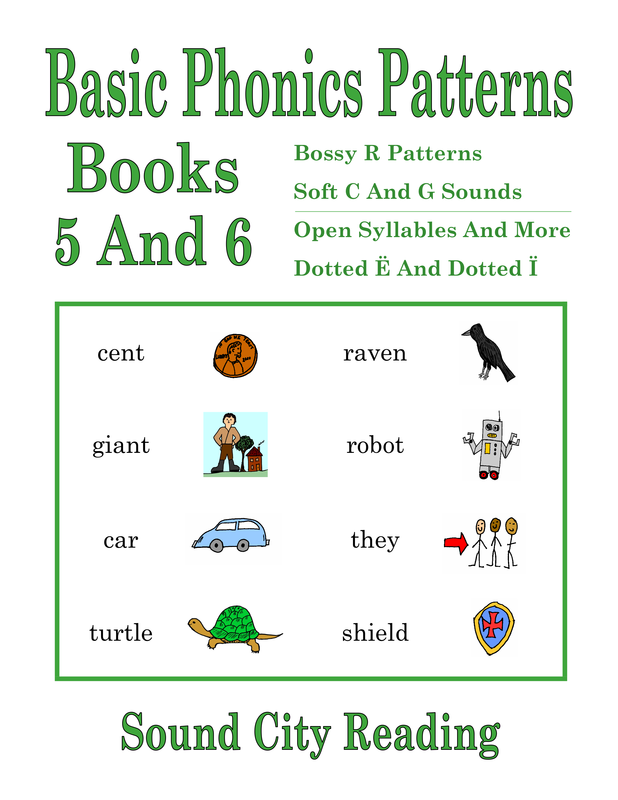 ​Basic Phonics Patterns, Books 1-8 (Review/reteach patterns). Advanced Phonics Patterns From Children's Books. 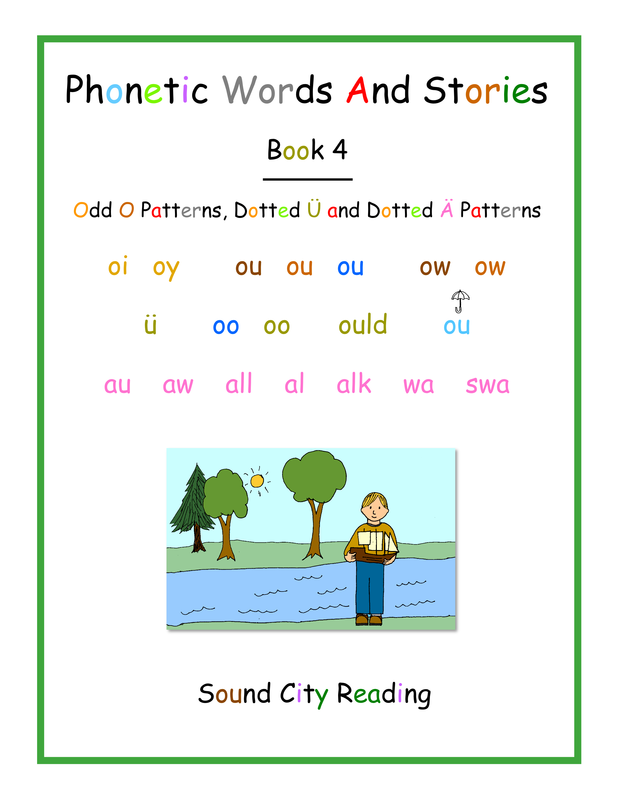 Know The Phonetic Code, Volumes 1-3 or Know The Phonetic Code, No Stories to review/reteach patterns. 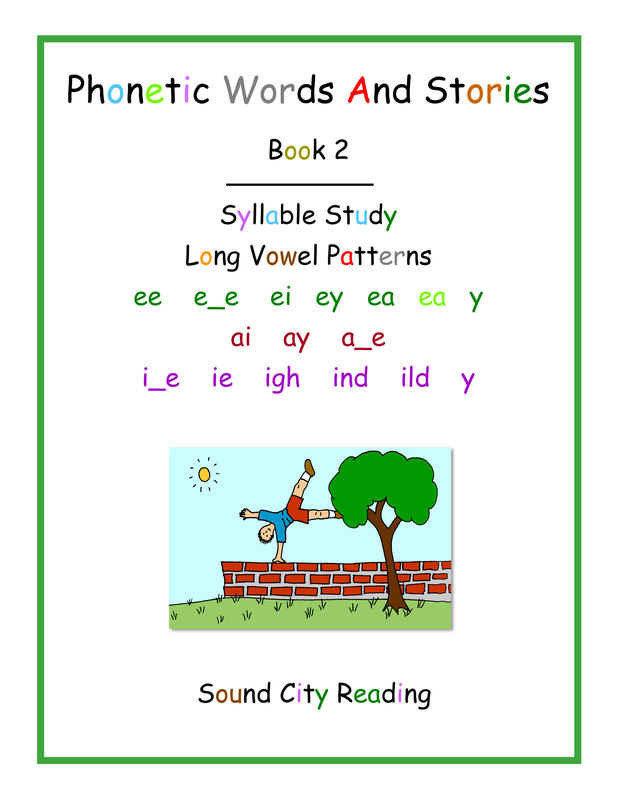 These suggestions assume that students have successfully completed one of the Sound City Reading short vowel books. If students are not able to handle the short vowel books, they should begin with Exploring Sounds In Words. If students don't know the alphabet letters and their sounds, they should begin with Learning The Alphabet, Books 1 and 2.